Here's a remark I've heard more than once from macroeconomists who are old enough to remember the 1970s: If you could go back to 1979 and tell people that the big problem facing central banks in 2016 would be getting the inflation rate up to 2%, they would all have fits of laughter leading to cardiac arrest. Case in point is the Bank of Japan, which has tried keeping its policy interest rate close to zero for twenty years, and has engaged in a massive QQE (qualitative and quantitative easing) program since April 2013, with the result that inflation is still well short of their 2% target. On Friday, the BOJ announced a new program - "Quantitative and Qualitative Monetary Easing with a Negative Interest Rate," which involves a continuation of the QQE program, along with a reduction in the interest rate on reserves held by banks with the BOJ. As described here, the plan for paying interest on reserves is somewhat complicated, with three tiers of reserves and different interest rates applied to each. Paraphrasing, interest will be paid at 0% on required reserves, at 0.1% on a reference level of reserves (a bank's average excess reserve balance during 2015), and at -0.1% on anything in excess of the sum of those two quantities. The effect of this will depend on how reserves are distributed in the financial system. For some banks the marginal unit of reserves will earn -0.1%, and for some banks the marginal unit will earn zero or 0.1%. Why can nominal interest rates be negative? 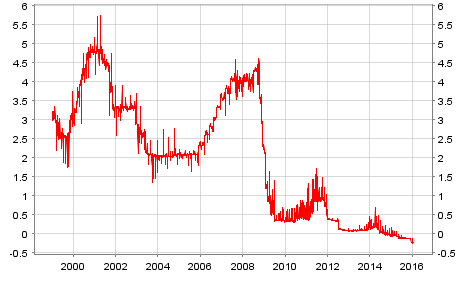 In most mainstream monetary models there is in fact a lower bound of zero on the nominal interest rate. Why? For example, in a standard New Keynesian (NK) "cashless" model, people hold zero money balances in equilibrium, and all other safe assets, including government debt, bear interest. If the nominal interest rate on all of those safe assets were negative, then people could borrow at the safe rate of interest (in baseline NK models there is no default), hold cash, and make a profit. Arbitrage then dictates that the nominal interest rate cannot fall below zero. In practice, the nominal interest rate on currency is always zero, so if it were costless to hold currency and to convert it into reserves and vice-versa, then if banks faced a negative interest rate on reserve balances they would always prefer to hold currency rather than reserve balances. The reason that the interest rate on reserves can be negative is that it is not costless to hold currency, nor is it costless to convert reserves into currency, or vice-versa. Currency can be stolen, and it takes up physical space, which makes it extremely inconvenient for large interbank transactions. For a bank in the United States, converting currency into reserve balances means putting the currency in a truck and taking it to the local Federal Reserve Bank (or one of its branches), which of course uses up time and resources. 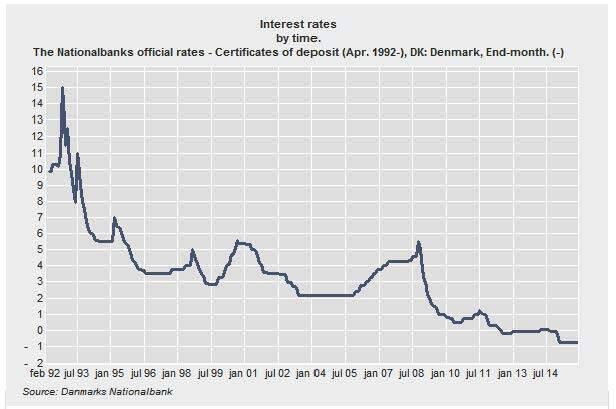 There is nothing new about negative interest on reserve balances - some central banks, including the Swiss National Bank, the Central Bank of Denmark, the Swedish Central Bank, and the ECB, have been doing this for some time. Further, negative nominal interest rates have been discussed extensively by economists. Some people like the idea, including Ken Rogoff and Miles Kimball, and have devised schemes that would in principle allow central banks to violate the zero lower bound in a big way. That is, at some sufficiently low negative nominal interest rate, arbitrage profits must overcome the costs of holding currency, and the nominal interest rate can't go any lower. But what if central banks did away with currency, or imposed extra costs on holding it? That would give them plenty of leeway on the south side of zero. GDP growth is fairly good and the labour market is strengthening gradually, but inflation is too low in relation to the Riksbank's target for inflation. In recent months, inflation has begun to rise and the repo rate needs to be this low so we can be sure that inflation will continue to rise and attain the target. A repo rate just below zero gives a further boost to household consumption and company investment. Together with the repo-rate cuts we have made earlier, this gives higher inflation in the long run and higher interest rates, which will also benefit all savers. It will take us back to a more normal situation in the Swedish economy and this will be good for us all. 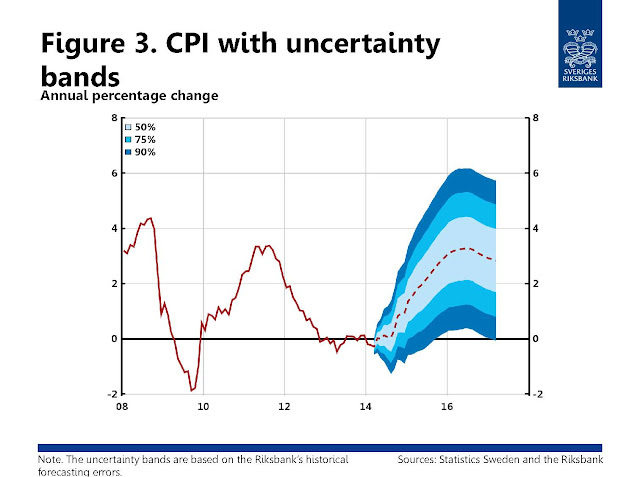 He's saying that, in terms of the Riksbank's goals, things are going well, except that inflation is running below the Riksbank's 2% inflation target. The Governor hopes for a future world in which inflation and nominal interest rates are higher. So, you might ask, why doesn't he just increase nominal interest rates, and allow the Fisher effect to produce higher inflation? No, he says, the way to do it is - here we have to read between the lines - to reduce the nominal interest rate below zero, stimulate real activity, and then the Phillips curve will produce the inflation that the Governor can then tamp down by increasing the nominal interest rate. Then we're back to normal. Same thing basically. The point estimate at the beginning of 2014 was that inflation would currently be in the neighborhood of 3%, but actually inflation is currently at about 0%, outside the 90% confidence interval in the 2014 forecast. That is, what actually happened was supposed to be highly unlikely. Some people have made a big deal of what they see as a policy mistake by the Swedish central bank - the interest rate hikes you see in the first chart beginning in 2010 which were subsequently undone. We could quibble about whether the Bank did the appropriate thing in 2010 - though I tend to agree with Marvin Goodfriend and Mervyn King that the Riksbank's 2010 tightening was well within the bounds of normal central bank behavior. However, what has happened post-2013 seems like a more obvious failure - the Riksbank has been pursuing a policy which isn't paying off as they say it will. Inflation remains persistently below the 2% target. So, that tells a consistent story. Central banks that have slipped into negative nominal interest rate territory don't tend to get any closer to their inflation targets. Sometimes they get further away. But that shouldn't be surprising, as that's what standard monetary theory predicts. 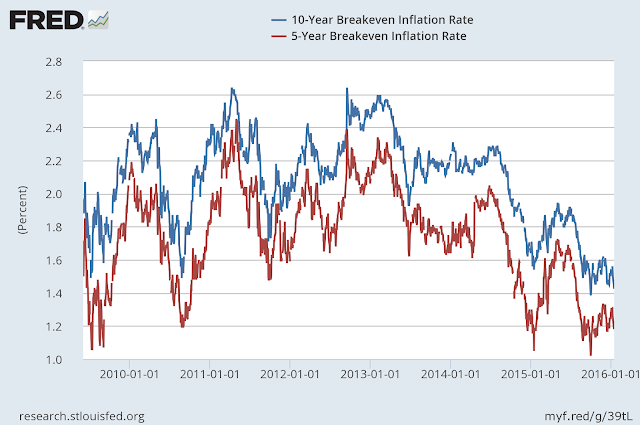 As I show here, lowering the nominal interest rate below zero just makes inflation lower. 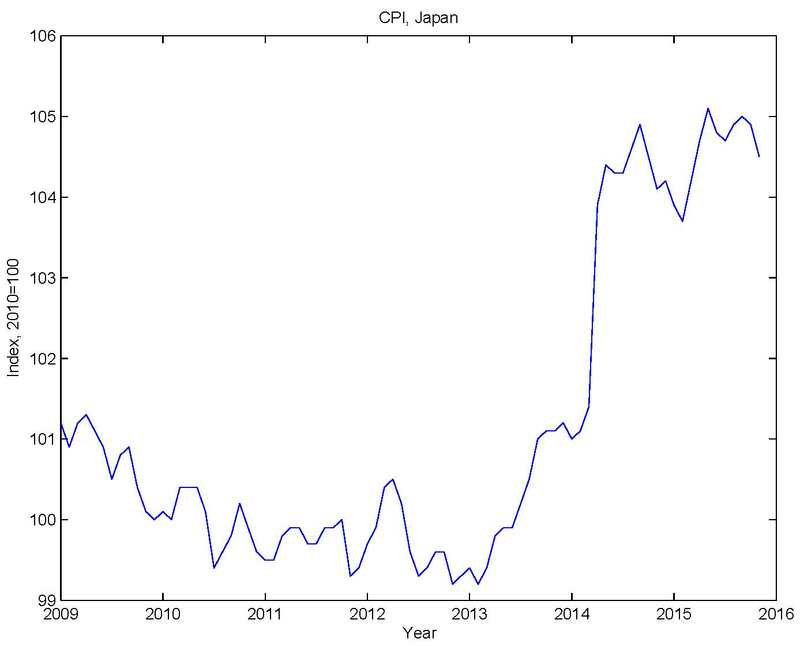 So, if the theory - neo-Fisherian theory - is so obvious, and given the experience we have already had with negative nominal rates, why does the Bank of Japan think that its new program will increase inflation? For a very long time, a Phillips curve theory of inflation was what central bankers believed, and in some countries those central bankers were successful in keeping inflation low, but not too low (assuming a 2% inflation target, say). This worked for the Fed, for example, during the Great Moderation period - parts of that episode look like the Fed had adopted a 2% inflation target, and was succeeding. Central bankers would cut rates in a recession, and then increase rates in the recovery. Even if inflation was not actually increasing in the recovery phase, central bankers could argue that a tighter labor market would surely increase inflation in the future. A typical argument was that, in the recovery phase, tightening needed to occur sooner rather than later, particularly given "long and variable lags," etc. As John Cochrane says, they could then pat themselves on the back for controlling the inflation which they had themselves created. But that doesn't work if central bankers don't get the timing right. If they wait too long to increase interest rates in the recovery phase, low inflation sets in, along with doubts about the wisdom of "tightening." Doubts give way to panic, which leads to lower and lower interest rates, and various experiments with unconventional polices - QE and nominal rates below zero. The Phillips curve was sometimes a convenient fiction, but in this instance it's a curse - believe in it and you're in trouble. So, what to do? Central banks, and many economists, won't declare the Phillips curve dead. The parrot is motionless at the bottom of the cage, but perhaps he's only pining for the fjords? Some, like Olivier Blanchard, are at least willing to concede that the parrot appears quite lethargic. But, religious conviction is very hard to overcome. One approach is to put religion aside, and show people that, even in models they like to use - models including Phillips curves - neo-Fisherian results hold, i.e. increases in nominal interest rates by the central bank make inflation go up. So, people can abide by their religious beliefs, but we are all neo-Fisherians. Mike Woodford is a neo-Fisherian, Knut Wicksell (and by implication Paul Krugman) was a neo-Fisherian. So, is Narayana Kocherlakota, though he's trying hard to deny it. 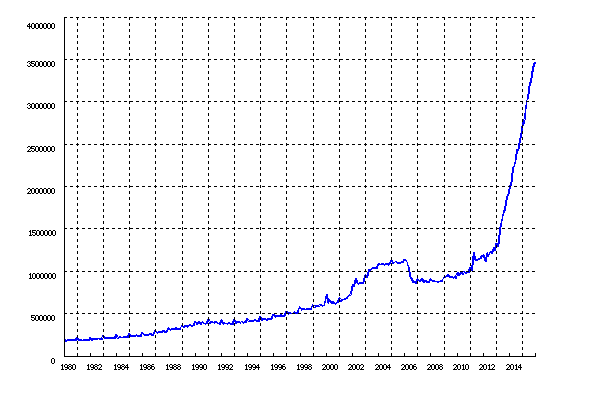 So, for central bankers currently seeing low inflation and wondering what to do, take the express route. There's no need to resort to a process of elimination. Most of the supposed solutions for low inflation - QE, negative nominal interest interest rates - have been tried, and haven't worked. Be neo-Fisherites. You'll sleep much better. ...the Federal Reserve Act’s vision of economic diversity is largely regional and sectoral in nature. [But, as]...we all know all too well, race matters: the average African-American’s experience with the US economy is very different from that of the average white person’s. I believe that the Committee’s deliberations would be even stronger if they took more account than they did in 2010 of this essential source of heterogeneity in our nation’s economic life. What Narayana means is that an average African American is more likely than the average non-African American to attend a below-average public school, be incarcerated, die at an early age, suffer unemployment, have low income, and have low lifetime wealth. And some of these problems are particularly acute for male African Americans. Do monetary policymakers pay no attention to these problems? Certainly, that's not the case. 1. Every three years the Fed conducts the Survey of Consumer Finances, or SCF. The SCF data is then available to the public, and is widely used by researchers both inside and outside the Federal Reserve System. Here's an example of a paper, done at the Board in Washington, that studies the racial wealth gap using SCF data. 2. At the St. Louis Fed, we have an extensive program in place that centralizes economic data (FRED) and historical data and documents (FRASER). Both of these facilities allow people to explore issues of economic inequality on user-friendly platforms (addendum: and there's also the Center for Household Financial Stability at the St. Louis Fed, as Christian has reminded me in the comments section - sorry folks). The Kansas City Fed also has a new data facility that is available to researchers. 3. The Fed has hosted conferences on inquality, and the effects of monetary policy on inequality in income and wealth. For example, this conference in 2014 at the Boston Fed featured a speech by Janet Yellen, on "Perspectives on Inequality and Opportunity from the Survey of Consumer Finances" (there's the SCF again). As well, the Fed has partnered with the Council on Economic Policies to host conferences at the Atlanta Fed and the St. Louis Fed. As well, the 1998 Jackson Hole Conference was addressed specifically to issues of inequality. The Federal Reserve conducts monetary policy in order to achieve maximum employment, stable prices, and moderate long-term interest rates. Monetary policy currently implemented by the Federal Reserve and other major central banks is not intended to benefit one segment of the population at the expense of another by redistributing income and wealth. Any decisions regarding redistribution are considered to be the province of fiscal policy, which is determined by elected policymakers. However, it is probably impossible to avoid the redistributive consequences of monetary policymaking. In other words, the Fed is constrained by its mandate from Congress, which gives the Fed specific goals - price stability and maximum employment. Further, the Fed was set up as an institution that is independent of Congress, but with some political control, in particular through the appointment of the Board of Governors, and approval by the Board of appointments of regional Fed Presidents. It is hard to deny that monetary policy has distributional consequences, and we need to understand these. But, the Fed needs to be wary of stepping outside of its Congressional mandate. That said, given our current understanding of monetary policy and its effects, any consequences of monetary policy for the income and wealth distribution are temporary, and perhaps small. So, my advice for any young person who is concerned about poverty in America and wants to do something about it, is that central banking is probably not the job for you. For example, suppose that, in 1988, Barack Obama had decided to go to MIT for a PhD in economics, instead of going across town to Harvard for a law degree. Then, suppose that things had gone really well for Obama as an economist, and that he was appointed as Fed Chair in 2009 (through some unusual circumstances of course) instead of taking office as President. Surely, President Obama's two terms as President have had a much larger effect on inequality in the United States, and in particular on the wellbeing of African Americans, than anything he might have done as Fed Chair. The primary "liabilities" currently on the Fed's balance sheet are currency (Federal Reserve notes and coins), reserves (roughly, checking accounts of financial institutions held with the Fed), and reverse repos (ON-RRPs discussed in this post), which play an important role in the Fed's intervention to control overnight interest rates. Currency and reserves are not liabilities in the sense that private debt instruments are liabilities. A corporate bond, for example, is a promise to make a future stream of payments. Currency represents only a promise to exchange one type of note for another - the Fed will exchange new Federal Reserve notes for ones that are worn out, and it stands ready to exchange four fives for a twenty, for example. Not everyone can have a reserve account, but for those institutions that do, the Fed makes some other promises - it stands ready to exchange one unit of currency for one unit of reserves, and vice-versa. ON-RRPs are different, in that they conform to the same rules as private secured debt. In particular, in an ON-RRP transaction, the Fed posts collateral in its portfolio (Treasury securities or agency mortgage-backed securities) to secure loans that are typically made overnight (though the Fed sometimes makes use of term ON-RRPs). But central bank liabilities are obligations in an indirect sense. 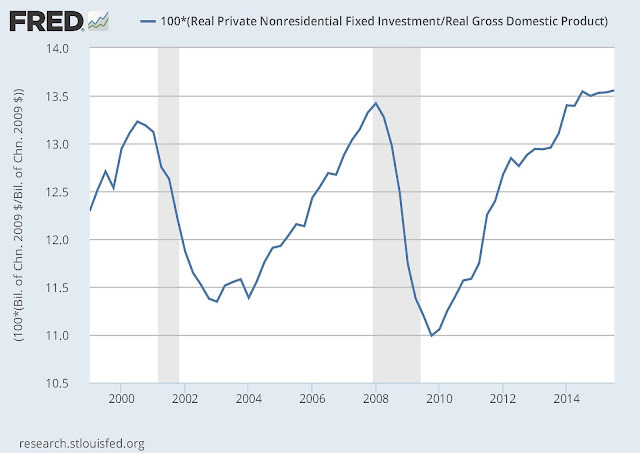 That is, the Fed makes promises about the future purchasing power of its liabilities. Central bank liabilities are unique: currency is a medium of exchange which no private financial institution issues, and Fed reserves play a special role in settling large transactions among financial institutions. The Fed has determined that Fed liabilities will perform these roles well if it commits to a 2% target for the annual rate of increase in the personal consumption expenditures deflator (the PCE deflator). That's a promise - a commitment. If the Fed keeps that promise, then this should reduce uncertainty concerning the real value of payments in long-term contracts, and thus make credit markets and the markets for goods and services work more efficiently. So, how has that been going? We are now well into our fourth year of sub-2% inflation. Of course, oil prices that have been falling since mid-2014 share some of the responsibility, but there is some concern (see this speech by Jim Bullard) that the additional oil price decreases we have seen will further prolong very low inflation. 1. TIPS securities compensate investors for CPI (consumer price index) inflation. 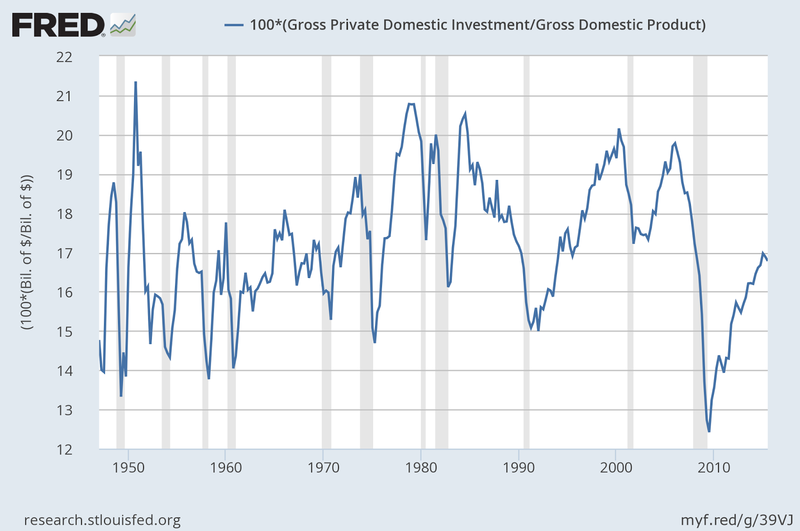 But the Fed cares about PCE inflation. The CPI is known to generate an upward-biased measure of inflation. 2. An investor in a TIPS does not make a payment to the Treasury when CPI inflation is negative - inflation compensation goes to zero whenever CPI inflation is less than zero. 3. Breakeven rates can reflect aggregate risk, which is variable over time. 4. 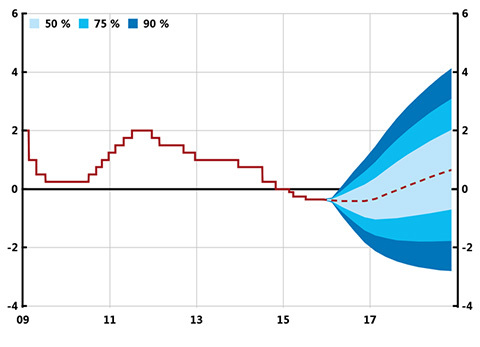 Breakeven rates can reflect market liquidity. For example if the TIPS market is less liquid than the market in nominal Treasuries, this will bias the breakeven rate downward as an estimate of expected inflation. And market liquidity can vary over time. There has been a flurry of concern in the last few days that all of these market-based measures of expected inflation have come down significantly in the last two years. If we believe these inflation measures, then we might be worried that the Fed's commitment to 2% inflation has become incredible - possibly market participants aren't buying it. And that would be bad. But the Atlanta Fed says we shouldn't worry. 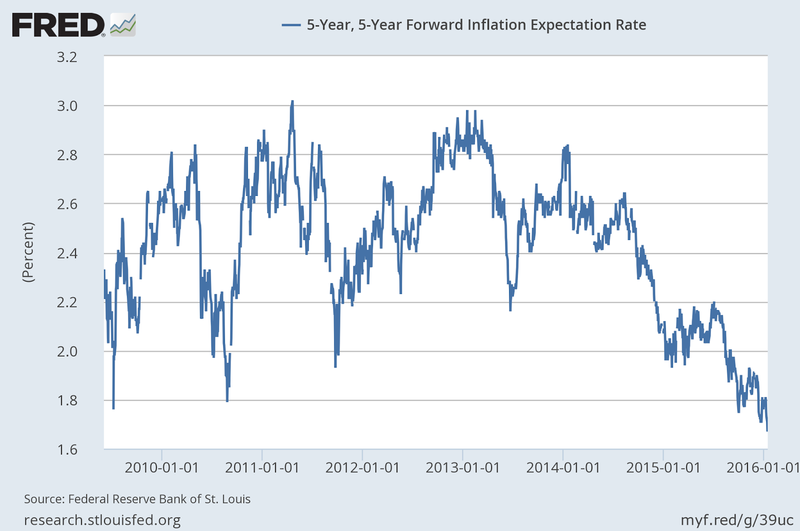 According to them, if we correct for the biases in standard market-based inflation expectations measures, inflation expectations have been quite stable. But suppose that the Atlanta Fed is wrong. Or, suppose that the Atlanta Fed is right but, even worse, market participants are wrong and inflation is actually going to stay low, unless the Fed does something about it. But it's not as if everyone is agreed on what "doing something about it" means. One view of inflation is that it's driven by a Phillips curve process - when output and employment are high, and unemployment is low, inflation is high. 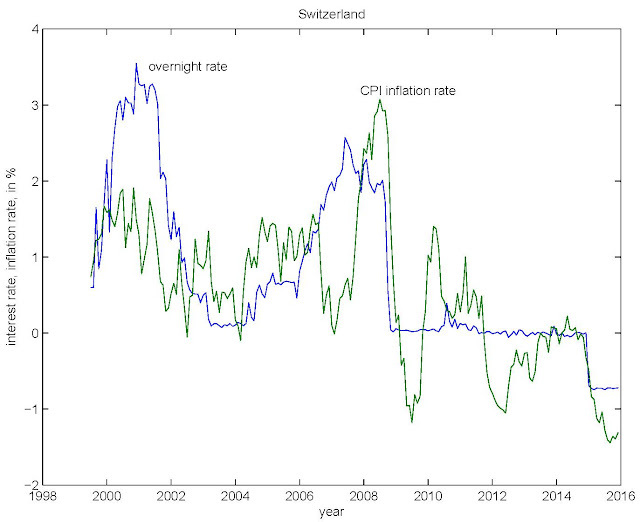 Then, the central bank controls inflation in a passive fashion, by leaning against the wind. When the economy "heats up," that produces more inflation, and the central bank cools things down by raising interest rates. When the economy "cools down" that produces less inflation, and the central bank heats things up by lowering interest rates. If this were the way the economy actually works, that would be great. Nothing subtle about it - you could get a group of 8-year-olds to run the central bank. 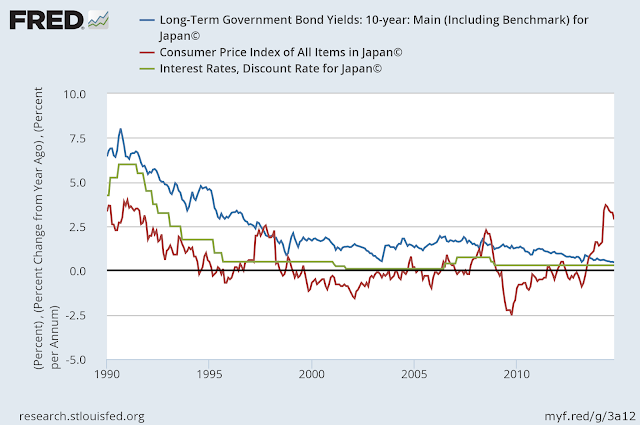 In the early 1990s, the Bank of Japan reduced short-term interest rates - you can see in the picture that the policy rate came down and has stayed close to zero ever since. In Japan, 20 years of ZIRP (zero interest rate policy), served only to produce an inflation rate that averaged about zero. You can see the drop in inflation expectations in the early 1990s in Japan, reflected in the falling 10-year government bond yield, which stays low, and even falls further, to where it is today. In the late 1990s, Japan looked much like the U.S. today (at least with respect to the measurements in the chart). Inflation was about zero, the 10-year bond yield was at about 2%, and the central bank's policy rate was close to zero. Some people, including Naryana, think that backtracking on liftoff would be a good idea for the Fed, given low inflation, and supposing that what we're seeing in market-based inflation expectations measures is measuring what's going on. 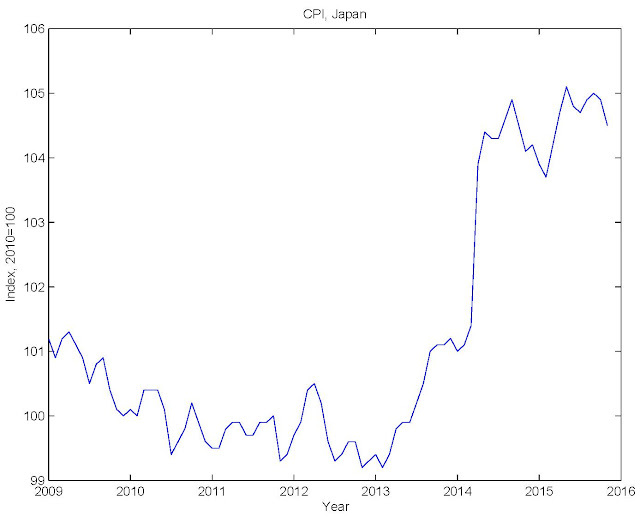 But the Japanese did that experiment - after the late 1990s they stayed with ZIRP, and inflation just went below zero. So, Japan is on the road to tripling the size of its balance sheet since the inception of the QE program in April 2013. 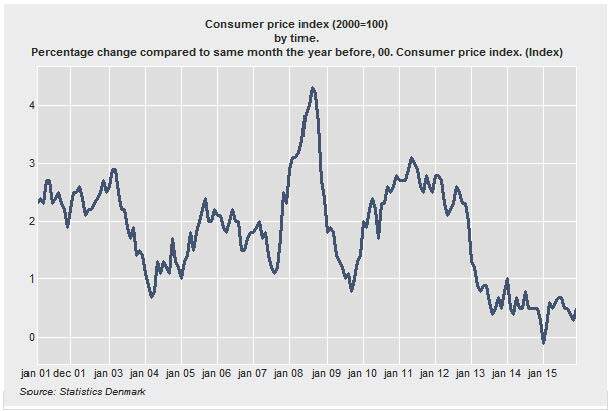 What's happened to the CPI? 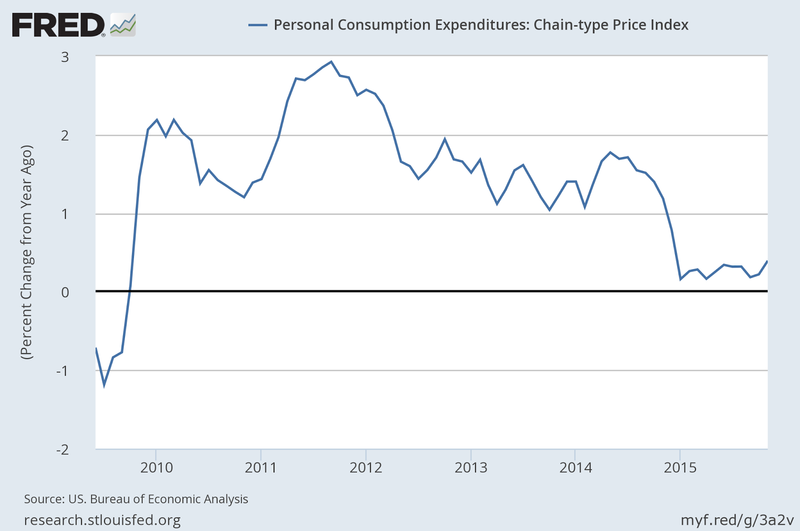 There was a burst of inflation in 2014, which appears to have had more to do with the direct effects of the consumption tax on the CPI, but inflation has essentially been absent since April 2014, in spite of a massive QE program. 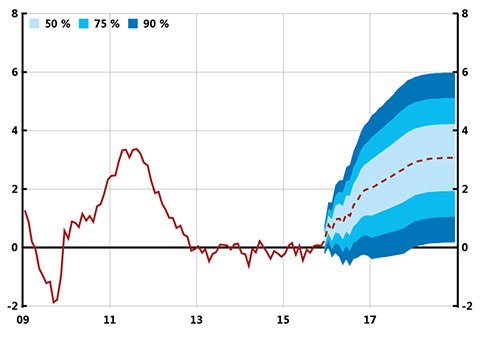 You can blame oil prices, but if QE actually works as advertised, it should have overcome that. Another suggestion is that, if all else fails, the central bank's policy interest rate can always go negative. However, theory, and experience, tells us that doesn't work either. The most egregious case is Switzerland, which currently has an overnight interest rate of -0.7%, and an inflation rate of -1.4%. So, this seems straightforward. If you're a central banker and want to increase inflation, don't model your behavior on a central bank that can't do it. Take as an example someone who's serious about it, and can produce results. Arthur Burns (Fed Chair, 1970-1978), and G William Miller (Fed Chair, 1978-1979) seem to have known the trade. What did they do? 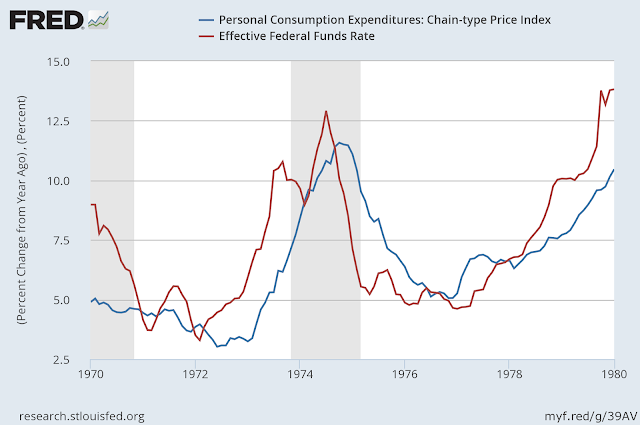 Over the 1970s, the fed funds rate moved pretty closely with inflation. 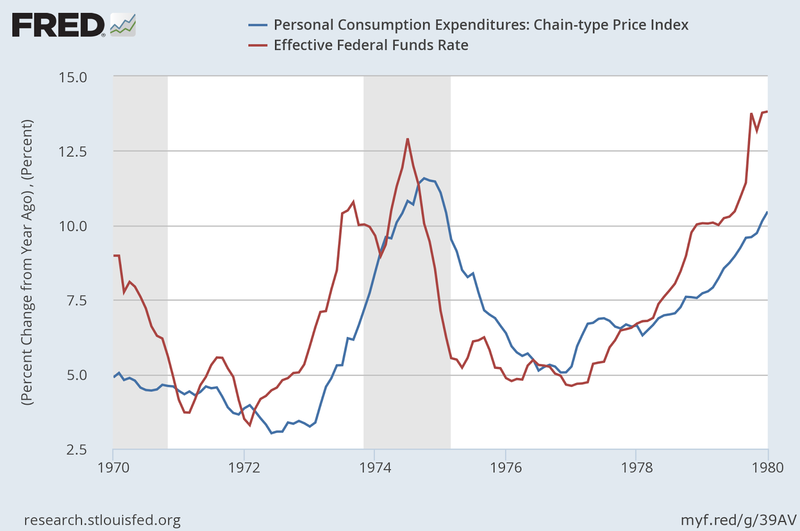 And it doesn't appear to be responding passively - through most of the period the fed funds rate leads inflation. Burns and Miller left a legacy of high inflation for someone else to clean up, but at least they showed us how neo-Fisherian policy works. Don't think in terms of Phillips curves - worry about the Fisher effect. Higher nominal interest rates mean higher inflation. A helpful reader of my last post alerted me to one of the pitfalls of chain-weighted national income accounts data, complete with references (this one and this one). Chain weighting, in principle, gives us better measures of real GDP and inflation, but it has some negative side effects. For example, the chain-weighted expenditure components (consumption, investment, etc.) of chain-weighted real GDP do not add up to chain-weighted GDP. Further, in a long time series, calculations of ratios of expenditure components can be thrown off significantly. 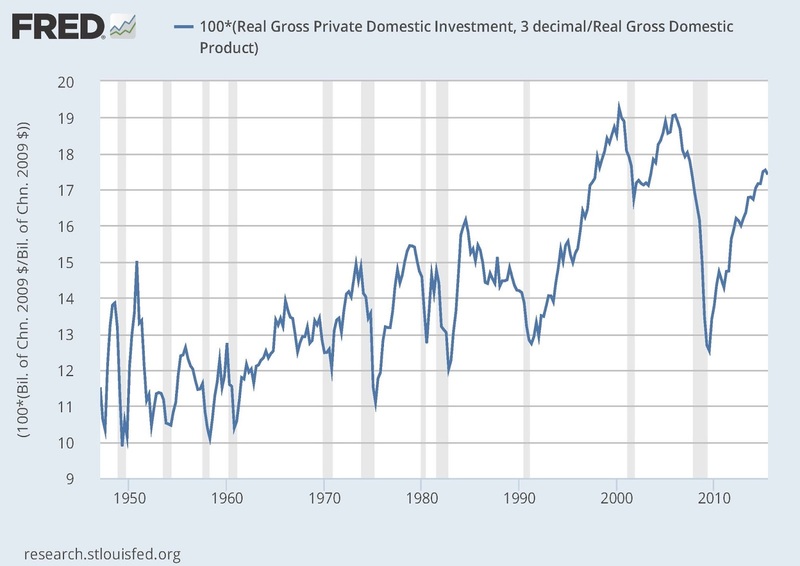 In my last post, in fact, the investment ratios I was looking at were ratios of chain-weighted real investment to chain-weighted real GDP - my bad. 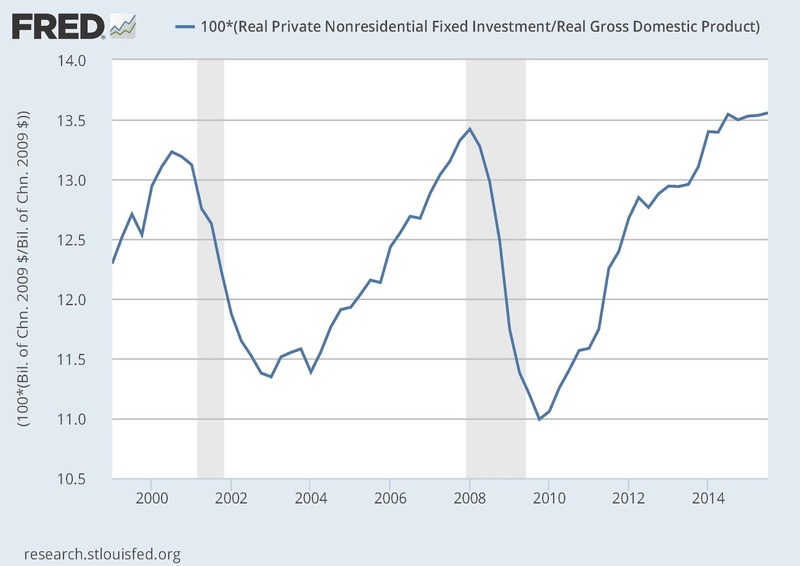 Again, that's not booming, but the current nonresidential investment rate is about at the post-1980 average, and is higher than the sample average of 12%. So, my story is essentially the same, and is consistent with Rachel and Smith's measurements (though not with their story). The current investment rate is about at the post-1980 average, even if you include residential investment, but the real rate of return on capital is not low. So, we don't want to use a savings glut/secular stagnation story to explain why the real rate of return on government debt is low. Addendum: Now I'm not sure this is better. But, apparently (I don't have references, but I have heard this said), the relative price of capital goods has fallen over time. So, wouldn't I want to use ratios of real investment to real GDP to measure the investment rate? Maybe chain weighting messes with that measure, but why is it any worse than the ones above, that don't account for the relative price change? Mark Thoma called my attention to a Vox blog post by Rachel and Smith, who are at the Bank of England. The post is a condensed version of this Bank of England working paper, which assembles a lot of evidence on low real interest rates, and takes a global perspective. 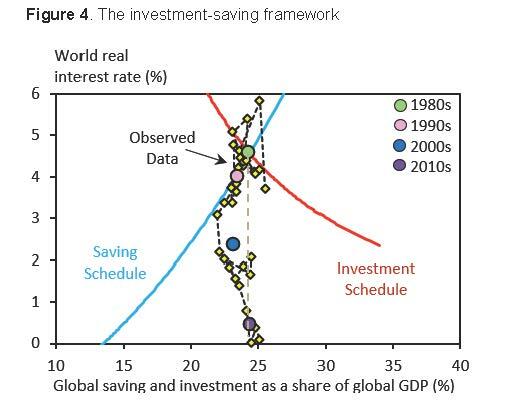 Rachel and Smith's argument is that world investment rates have not changed much from the 1980s, but real interest rates have fallen substantially. Therefore, according to them, this seems consistent with a Bernanke "savings glut" story (a shift to the right in the saving schedule in the figure) and a Summers "secular stagnation" story (a shift to the left in the investment schedule in the figure). In fact, you can't explain their quantity/price data with only a savings glut story or only a secular stagnation story. 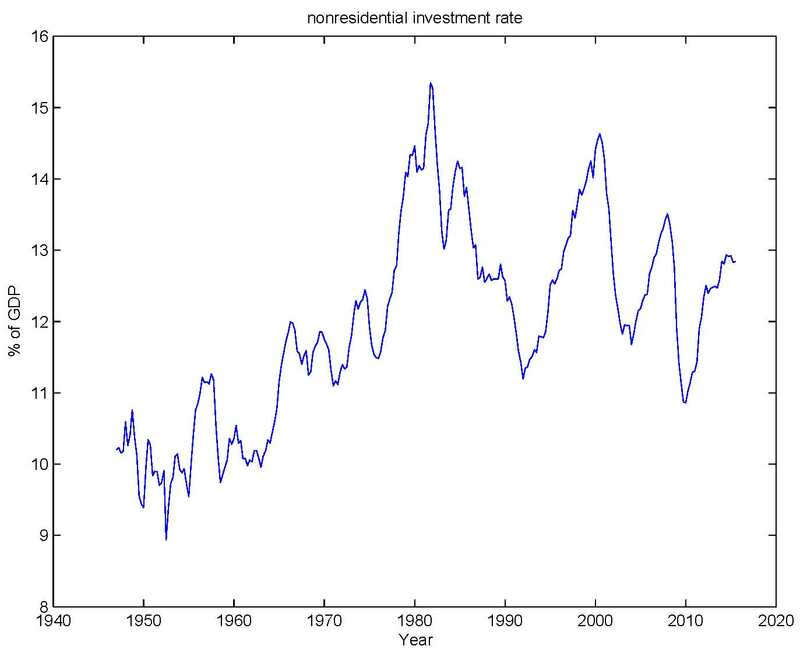 So, in the United States, investment rates are somewhat high relative to the 1980s (the disaggregated data on nonresidential investment is available only post-1999) and, as is well-known (see for example this paper by Hamilton et al.) the real interest rate on government debt has fallen substantially since the 1980s. 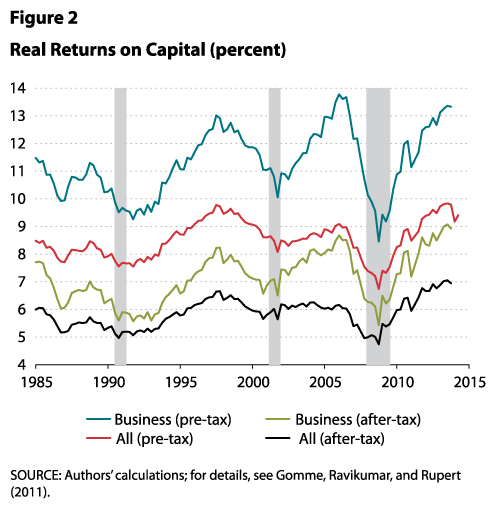 So, for the United States, the rate of return on capital is higher than in the 1980s, and investment rates are higher. That doesn't square with savings gluts and secular stagnation. As I argue in the slides I link to in this post, I think it's more useful to think about asset markets in explaining low real interest rates. For the U.S., it's important that we consider the market for U.S. Treasury debt, and what makes demand high and supply low in that market. That then has implications for monetary policy and inflation that I think are interesting. See the slides for the details. I'm pleased to see that Narayana Kocherlakota seems interested in Neo-Fisherism. The crux of what he wants to say is in this note. What's that about? Narayana starts with a more-or-less standard New Keynesian (NK) reduced-form setup. There's an equation pricing a nominal bond (the "IS curve" in NK-speak) and a Phillips curve, simplified here to include only the output gap, and omitting the usual inflation expectations term. The key difference, though, is that Narayana is going to work with this framework assuming a finite horizon. It's of course well-known that a finite horizon presents problems in monetary economies. If the economy has a known final date, then no one wants to hold money (an intrinsically worthless object) at the final date. So, working backward, money will be valueless at all dates. Not very useful if we want to do monetary economics. There are fixes, though. The standard one, used extensively of course, is to just assume an infinite horizon. This solves other problems too - even in non-monetary models an infinite horizon can make life easy for the modeler. Another fix is to suppose that the world ends with some fixed probability on the next date. That works much like infinite horizon, and is tractable. As well, one could assume a finite horizon in a monetary model, and suppose that the government does something on the final date to give money value. For example, money is required to pay your taxes, or the government in some other fashion retires the money stock in exchange for goods. That approach is not so tractable, and is not used much (off the top of my head, I can't think of a reference, but maybe you know one). In Narayana's finite horizon economy, there is a further set of issues which come up, as this is not a monetary economy in the usual sense. It's a cashless Woodford NK economy. In the infinite-horizon version, prices are all quoted in terms of a numeraire, called money. In this world, anyone can trade one unit of numeraire for 1+i(t) units of the money in the next period, where i(t) is the nominal interest rate, and the central bank has the power to set i(t) each period. No money balances are held in this world, and the central bank avoids plenty of messy stuff that it has to do in the real world - open market operations, etc. Mike Woodford took great pains in his book to convince us that this setup makes sense. Narayana then faces a couple of problems in working with a finite-horizon version of the standard NK model. The first is that the New Keynesian Phillips curve in the infinite horizon reduced form is derived from Calvo pricing in a stationary environment. But in Narayana's setup, when firms make pricing decisions, they are going to do it differently depending on how close they are to the terminal date. That problem is never addressed in Narayana's note. The second problem he does address, which is that we need to determine the inflation rate at the terminal date. Narayana assumes that the final-period inflation rate is fixed by fiscal policy. You might think that sounds OK, if you're accustomed to thinking about standard monetary models - in that context, fiscal policy can indeed solve the problem. But here, it's hard to see what it is that the fiscal authority does to fix the inflation rate in the final period, as the model is cashless. Seemingly, this works just like monetary policy does - if the central bank can dictate the nominal interest rate, I guess the fiscal authority can dictate the inflation rate. Of course, you might then ask why the fiscal authority can't just dictate a whole sequence of inflation rates for all time, and be done with it. Narayana takes this model and considers a policy experiment. The central bank fixes the nominal interest rate for all time. What happens? With an infinite horizon, this is straightforward. Given Narayana's parameter restrictions there are many equilibria, but all equilibrium paths converge in the limit to a steady state in which the real interest rate is equal to the "natural rate," and the inflation rate is equal to the nominal interest rate minus the natural rate - in the long run there is a one-for-one Fisher effect. Narayana calls this the "neo-Fisherian hypothesis," but it's not a hypothesis, it's just a property of a wide class of models that macroeconomists work with. Neo-Fisherism is actually more accurately stated as: "Excuse me people, I think you might have the sign wrong." I expand on that in this post. Indeed, a serious neo-Fisherian is going to worry not only about Fisher effects, but about short-run liquidity effects, persistent movements in the real interest rate, and the long-run effects of monetary policy on the real interest rate. Now, consider the finite horizon. If the fiscal authority happened to choose the Fisherian steady state inflation rate in the final date, then the equilibrium would be that steady state, for all time. However, since the steady state is stable solving forward, it's unstable solving backward, so given a final-period inflation rate away from the steady state, the inflation rate is further from the steady state the further in the future the final date is. In equation (5) of Narayana's note, a higher nominal interest rate then implies that inflation is lower at every date. Equation (5) also tells us that the fixed final-period inflation rate - that is fixed ("anchored" as Narayana says) inflation expectations in the last period - has a larger and larger effect the further we are from the final period. That is, anticipated inflation very far in the future has an enormous effect on inflation today. If you think that raises questions about how seriously we want to take this, then I agree with you. I've left the output gap term out of the Taylor rule, for convenience. In the infinite horizon case, if we assume the Taylor principle (alpha > 1), then there are two steady states - the zero lower bound (ZLB) and the desired steady state in which the central bank achieves its inflation target. There are many equilibria converging to the ZLB. Both steady states are Fisherian, in the sense that the real interest rate in the steady state is the natural rate, and the inflation rate is equal to the nominal interest rate minus the natural rate. With 0 < alpha < 1, the desired steady state is the unique steady state, and there are many equilibria, all of which converge in the limit to the steady state. Now, consider the finite horizon. As with Narayana's analysis, suppose the fiscal authority fixes the inflation rate at the final date. 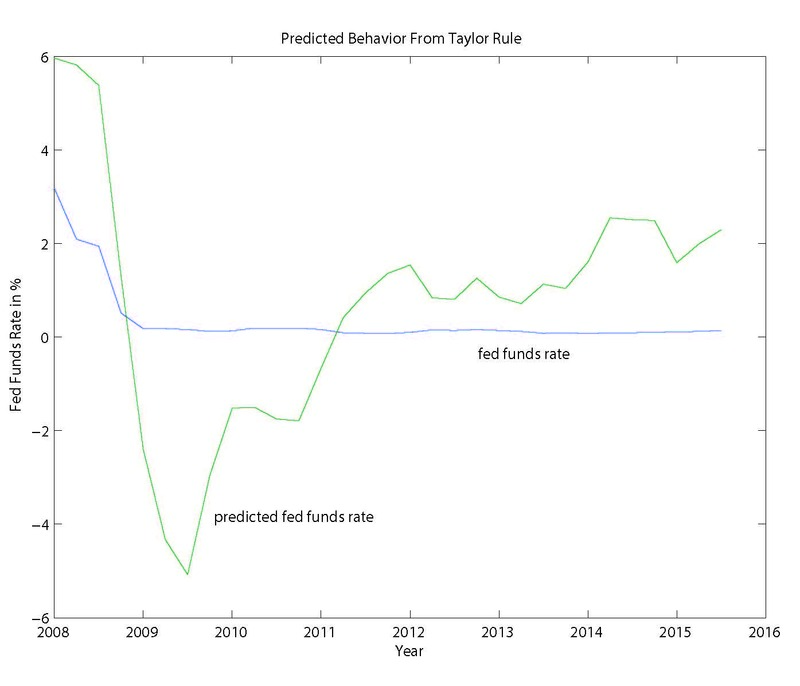 Then, under the Taylor principle, if we solve backward from the terminal date, we get closer to the desired inflation rate. 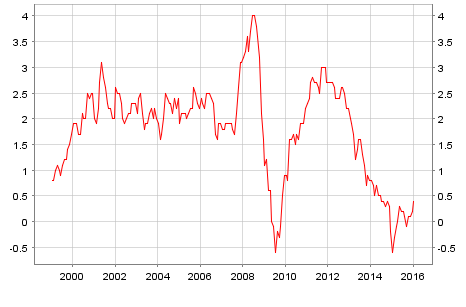 The fiscal authority, presumably not in tune with the central bank, can set a terminal inflation rate that differs from the central bank's target inflation rate, but the further in the future is the terminal date, the less that matters for the first-period inflation rate. Indeed, as the time horizon increases, the initial inflation rate gets closer and closer to the target inflation rate. Thus, for a long horizon, this economy is Fisherian to an extreme at the first date. Indeed, under the Taylor principle, and with a long horizon, if the central bank increases the target inflation rate, then it increases the nominal interest rate roughly one-for-one at the initial date, and the actual inflation rate increases at the first date, roughly one-for-one. So, it would be incorrect to say that this finite-horizon economy does not have Fisherian properties. 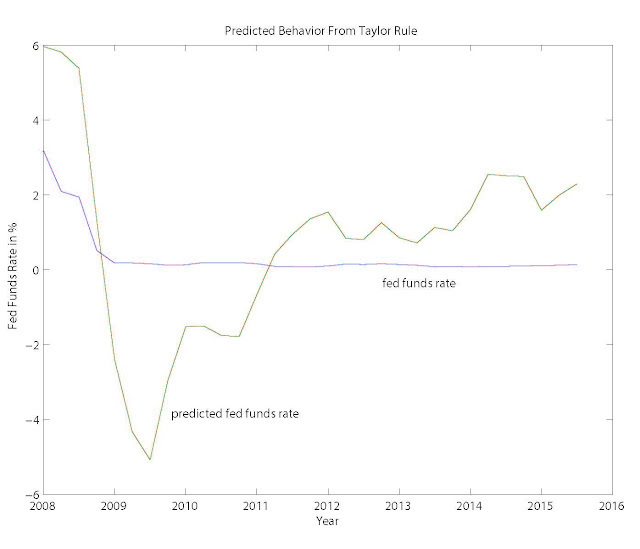 If the central bank does not adhere to the Taylor principle in the finite horizon economy, then things can go badly. If the horizon is long and the fiscal authority chooses a terminal inflation rate below the central bank's target rate, then the nominal interest rate will stay at the zero lower bound for some time before it increases until the terminal date - inflation is always below the target. So, Narayana's note didn't give me cause to worry about infinite horizon monetary models, or about neo-Fisherism. His finite horizon framework has some problems, but in spite of those problems it actually has some Fisherian properties. Here are some slides on low real interest rates, from a session at the ASSA meetings in San Francisco. In case you haven't noticed, Narayana Kocherlakota has been writing blog posts since arriving at the University of Rochester. I'm interested mainly in the most recent of these, in which Narayana attempts to make the case that monetary policy in the United States is currently "overly tight." ...the Committee decided to raise the target range for the federal funds rate to 1/4 to 1/2 percent. The stance of monetary policy remains accommodative after this increase, thereby supporting further improvement in labor market conditions and a return to 2 percent inflation. So, if the Fed had behaved as it did from 1987-2007, liftoff would have occurred early in 2011, and the fed funds rate would currently be above 2%. Further, QE was never used before the Great Recession in the United States, nor did the Fed engage in explicit forward guidance, to the extent it now does. If we believe that QE is accommodative, and that forward guidance matters, then the Fed's large balance sheet and its stated future plans imply that Fed policy is unusually accommodative, on top of an interest rate policy that is already unusually accommodative relative to past behavior. So, in order to make the case that Fed policy is "overly tight," we would have to argue that there is something unusual going on that would warrant a different policy rule now, given the state of the world. Narayana claims there are "two persistent adverse effects" of "overly tight" policy. The first, according to him, is a loss in Fed credibility - people will come to expect that the Fed will undershoot its 2% inflation target. The second "persistent adverse effect" is a low employment/population ratio. Let's explore the first "persistent adverse effect." What do we know about the effects of monetary policy on inflation? In a previous post, Narayana links to a paper of his, in which he lays out his view of the world. The key working parts of Narayana's model are equations (1) and (2) on pages 4 and 5. This looks somewhat like a conventional reduced-form New Keynesian (NK) model. The first equation prices a one-period nominal bond - that's typically called an "IS curve" in the NK literature. The second is basically a Phillips curve, which posits a relationship between the inflation rate - one period in advance - and the current "marginal utility gap." That's a little different from conventional NK due to the dating of the variables, and the fact that the equation isn't derived from pricing behavior. The parameter restrictions will stop inflation from blowing up, or the price level going to zero. So, given our parameter restrictions, and a constant nominal interest rate, the inflation rate will converge in the limit to the nominal interest rate minus the subjective discount rate. And we could do experiments under which the nominal interest rate increases, once-and-for-all-time, in an anticipated fashion, and there will be convergence of the inflation rate to a higher steady state level. That is, if the nominal interest rate goes up, the inflation rate goes up, in a neo-Fisherian fashion. So, I would think that Narayana should be pleased that the Fed has finally achieved liftoff, as he seems worried about the fact that inflation and inflationary expectations are too low. In his model, the way to increase inflation and inflationary expectations is to increase the nominal interest rate. On the second "persistent adverse effect," Narayana thinks that monetary policy has contributed to the low employment/population ratio in the United States. As I pointed out in a post I wrote in August, by any conventional measure the U.S. labor market is tight, and nothing has changed much from August, except that the unemployment rate is lower. The rate of employment growth is high, the job openings rate is very high, and the unemployment rate is low. The labor force participation rate has fallen substantially since before the recession, but there is nothing to indicate that this is anything other than a long-run phenomenon. As such, there's no indication that this represents an inefficiency that monetary policy can correct. Narayana may know something we don't. If so, he should let us know.